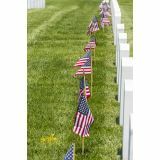 Our Cemetery Stick Flags are perfect to be used as grave markers in cemeteries during Veterans Day and other patriotic events to show your respect and love for our fallen heroes, leaders, fire fighters and soldiers who laid down lives in the service of nation. Easy to fix in the ground and take out, our cemetery stick flags from Tuff Flags make a thoughtful way to remember our servicemen who paid the ultimate price and to celebrate a life well lived. Our 100% made in the USA flags are available in various models and feature UV resistant inks that will remain bright and beautiful for a very long time. 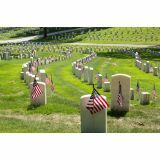 Shop from our complete line of Cemetery Stick Flags right away and get the best prices, quick shipping, and much more! 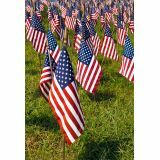 Made in the USA, our Cemetery Stick Flags display pride and solidarity during national events and memorial services. The ground spike design will make it easy to keep the flag in place in the ground for the volunteers. Add identity to the solemn moments with these cemetery stick flags, which make a beautiful display for ceremonial or memorial services. The pointed end of the wooden dowel allows easy installation in the ground for volunteers who will have to decorate countless graves just in time for the Memorial Day and other commemorative events.